Anderson-Hynes dismembered pyeloplasty is preferred when pelvic reduction may be necessary, a renal calculus is present, or a crossing vessel is encountered (Fig. 3). A dismembered pyeloplasty may have superior efficacy compared with the other nondismembered techniques. In the largest head-to-head comparison of laparoscopic dismembered (n = 25) and nondismembered pyeloplasties (n = 15), Klingler et al. showed superior efficacy for dismembered (96%) versus nondismembered (73.3%) pyeloplasty. FIGURE 4 ■ Laparoscopic Foley Y-V plasty. FIGURE 3 ■ Laparoscopic Anderson-Hynes disemebered pyeloplasty. FIGURE5 ■ Laparoscopic Fenger pyeloplasty. the ureter and pelvis are approximated (Fig. 3C). 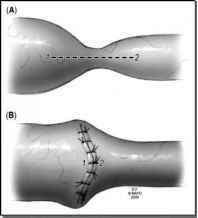 The intervening gaps on the front and back of the anastomosis can be closed with either running or interrupted suture.